Three teenage boys were stabbed to death in Birmingham over 12 days earlier this year, with police chiefs branding knife crime as a "crisis and an emergency". "We shouldn't be living in a world where having knives feels necessary," he said. "We are walking distance from London and there's a lot of focus on what's been happening in London and we just want to say 'it's a problem here too and we need support'." 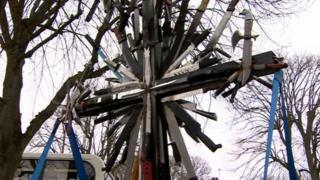 Image caption Reverend Andrew Brazier said we "shouldn't be living in a world where having knives feels necessary"
The protestors will walk through Kenilworth, Daventry, Dunstable and Watford on their way to London - spending nights at local churches along the way. Across England and Wales there were 285 killings by a knife or sharp instrument in the 12 months ending March 2018 - the highest figure since records began in 1946.